Tell us a bit about your Apple setup and why you chose it? In short… I love tech, and Apple makes really nice tech. My setup was installed with a minimalistic, yet practical focus (hiding cables, dedicated power points, and behind-wall cable routing, etc). 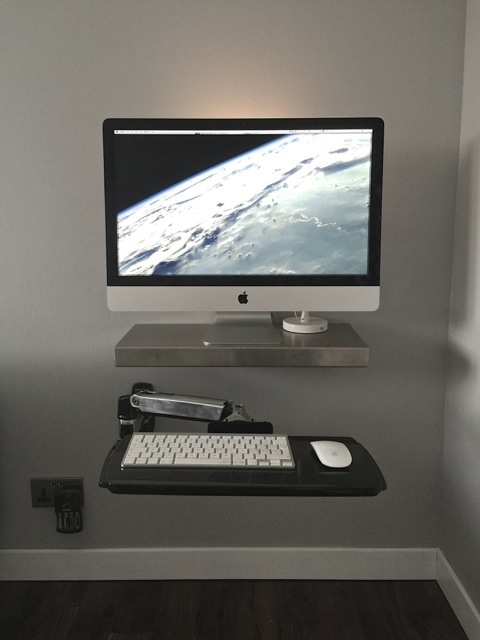 The iMac sits on stainless steel floating shelf, and the keyboard stand is a fully adjustable articulating arm (both the shelf and arm are spaced and secured to the exterior wall – yes, I’m the king of over-engineering). 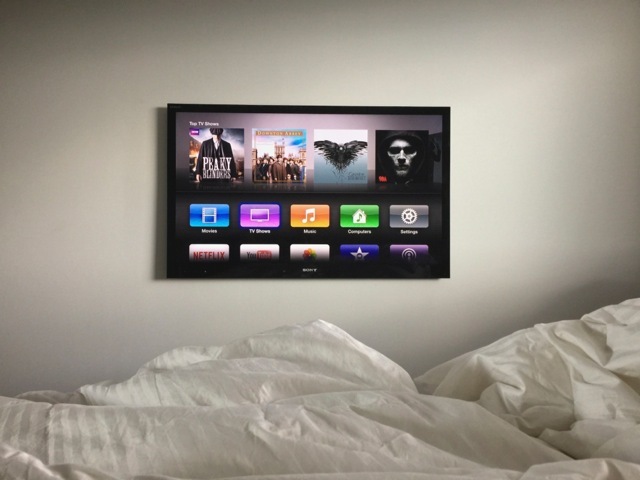 Both the Mac Mini and Apple TV are attached to televisions that are wall mounted, one is in the lounge, and the other is located in the bedroom. What hardware makes up this Apple setup? My primary usage of the Macs are photo and video editing, web design, gaming, media playback, and a bit of everything else. Is there an app that you use most often or recommend? Aside from the usual core Mac app suite, I use Divvy, I find it essential for taking control of your workspace. The Mac Mini uses Plex for media management and playback. Editor note: For those interested in setting up a similar Mac Mini media center, you can learn how to setup a Mac media center with Plex here. It’s also worth pointing out that almost any Mac can connect to a TV these days, though you will need a proper video adapter and a HDMI cable. Of course, getting a similar degree of beautiful minimalism as shown in this great setup requires quite a bit more effort! Do you have a great Apple setup or Mac workstation you want to share with OSXDaily? Answer some questions about your hardware and how you use it, take a few high quality pictures, and send it on in! Go here to get started, it’s easy peasy. 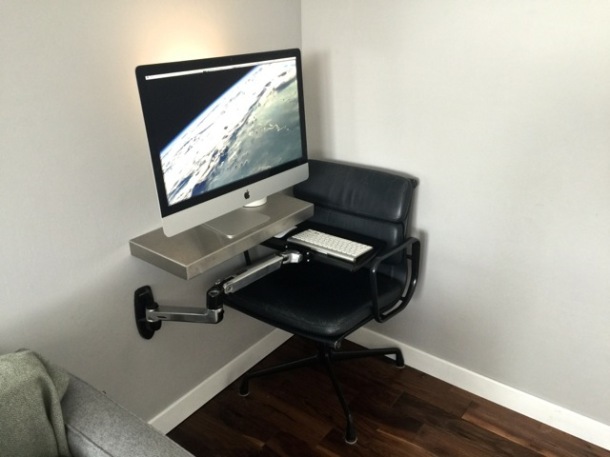 You can also browse through the many Mac setups featured from before, there are a lot of great workstations out there to be inspired by! Seriously, that wall mounted TV and Mac Mini in the living room. Wow, I want THAT. It looks like a showroom! Any idea what model TV that is and the brand of mount? Looks like a 50″ Samsung LED? Share if you can. Incredible mounting of the TV it’s remarkably flush, usually they stick out quite a bit and look, well, not that great, this one looks amazing. And the cords are completely hidden, are they thread through the wall? A+++ Absolutely gorgeous setup, very modern. Makes me want to re-do my family room! If you look closely, it is a Sony. No way to tell what model unless Adam replies. Pretty sweet. Like the minimalism. Hi guys. Thanks for the comments. FYI, the lounge tv is a 55″ Sony Bravia (kdl-55829). Yes, wiring is hidden behind wall in cases…a good bit more work but well worth it. What games can you play on that? 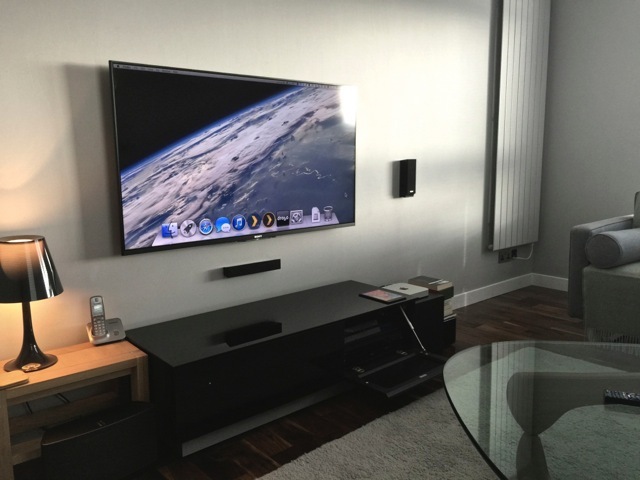 how is your apple tv mounted behind the tv? special bracket? velcro? do you have any IR issues with the remote? i too am interested in this answer. Apple TV is supported not behind the TV, but in the wall cavity so is completely hidden. iPhones and iPads are used as remotes. What is the bedroom TV? Any tips on how to flush mount the LED like that? It’s a sony bravia 46″. Uses ‘ultra slim’ wall mount (adds almost nothing to profile). How do you turn your AirPort Extreme into a wireless backup tool? Is it a simple matter of attaching external HDDs to it and then using Time Machine as usual? That’s fantastic ! Really like how it’s clear and minimalistic. Thumbs UP! What speaker set up is that in the living room? I like their small foot print. How is the sound from them? The iMac workstation looks like a surgical ward in solitary confinement, somewhere behind the Iron Curtain. Nice set up… gives me some definite ideas for my next place…. I work on my I-Mac everyday in web design school, so I do like some apple products. Plus, I love interior design too. I love the minimalistic features of your set up.